Some of the properties of the Dock, the handy application launcher that usually resides at the bottom of your screen in OS X, can be modified to suit your preferences. Because you'll use the Dock often, you should set it up just the way you want it. The Dock's default location is the bottom of the screen, which works well for many individuals. But if you prefer, you can move the Dock to the left or right side of your screen by using the Dock’s preference pane. Click the System Preferences icon in the Dock, or select the System Preferences item from the Apple menu. Click the ‘Dock’ icon in the Personal section of the System Preferences window. Left positions the Dock on the left edge of your screen. Bottom positions the Dock along the bottom of your screen, the default location. 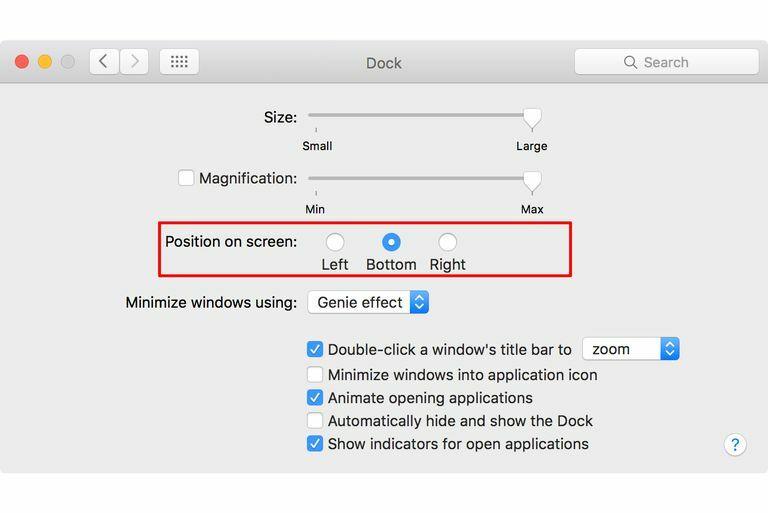 Right positions the Dock on the right edge of your screen. Click the radio button of your choice, and then close the preference pane window. Try all three locations, and see which one you like best. You can easily move the Dock again if you change your mind. Using System Preferences to move the Dock around is simple enough, but there is actually an even easier way to perform the task. The Dock, for all practical purposes, is really just another window on your desktop. It may be a highly modified window, but it shares one common window attribute: the ability to be dragged to a new location. Although you can drag the Dock around, you're still limited to the three standard locations: the left side, bottom, or right side of your display. The secret of dragging the Dock around is the use of a modifier key, and the special spot on the Dock you need to grab to perform the drag. Hold down the shift key and position your cursor over the Dock separator; you know, the vertical line between the last app and the first document or folder on the Dock’s ribbon. The cursor will change to a double-ended vertical arrow. Click and hold while you drag the Dock to one of the three predetermined locations on your display. Unfortunately, the Dock remains anchored to its starting point until your cursor moves to one of the three possible Dock locations, at which point the Dock snaps into place at the new spot. There's no ghost outline of the Dock as you move it about; you just have to believe that this trick will really work. Once the Dock snaps into the left side, bottom, or right side of your display, you can release the click and let go of the shift key. The Dock uses a middle alignment in all positions it can be placed in. That is, the dock is anchored at the midpoint and grows or shrinks its other edges to accommodate the number of items in the Dock. Up to OS X Mavericks, you could change the Dock’s alignment from the middle to either edge using a Terminal command. For some reason, Apple omitted the ability to pin the dock by the edges in OS X Yosemite and later. Press the Enter or Return key on your keyboard to execute the command. The Dock will disappear for a moment, and will then reappear pinned to the selected edge or middle. Don’t forget the killall Dock command after you execute the defaults write command. You can try out all of the various Dock locations options we mentioned in this guide until you find the configuration that best meets your needs.